Mostly so I don't lose it, here is data for plotting the counts of phylogeny (and cognates) in the literature, and comparing them to counts of SDM/ENM in the literature, 1980-2013. Left y-axis: counts of phylogen* in the literature. 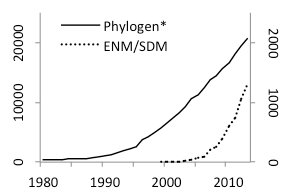 Right y-axis: counts of ENM/SDM (and similar terms) in the literature. The plot was inspired by similar plots by David Hillis and Brian O'Meara (for phylogenies) and Dan Warren (for ENM/SDM). The statistic that approximately 1% of all published biology research involves phylogenetics is from David Hillis, personal communication.